Casino Kingdom has been around in one form or another since its inception in 2002 when it fell under the Captain Cooks Casino group. The group was then bought by Casino Rewards Group in 2005 and are now offering a no fuss casino that is solidly built on a foundation of giving players exactly what they want across the UK. So whethr you are from England, Ireland, Scotland or Wales, you can rest assured that endless fun is just a click away! 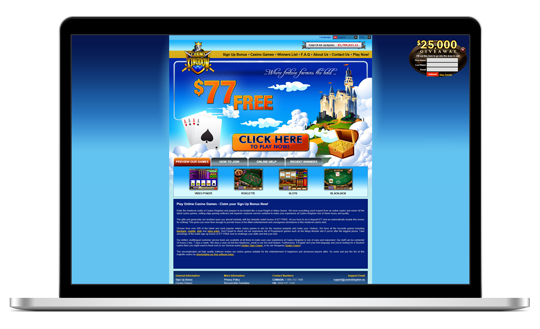 Casino Kingdom’s theme ties in well with its name; a blue background gives way to a stylised fairy tale castle nestled in clouds with a slogan informing the player that they’ve found the casino “Where fortune favours the bold…” It does seem to be a bit archaic as the graphics aren’t representative of a modern online casino. The page layout is rather simplistic with quite a number of links embedded into graphics rather than tabs. The presentation at first glance seems sparse and lacking but on closer inspection, you’ll find everything you’re looking for albeit without the glitz and glamour that you’ll find on other casinos. In keeping with the minimal structure of the casino the only Bonus that’s available from the onset of registration is a £77 Match Bonus that rewards you with a 100% Bonus when you deposit£77. A £25,000 draw is also offered to sweeten the deal and no deposit is required to take part in the give away. According to the casino they offer a range of fantastic offers which are continually updated as well as Casino Rewards, a loyalty programme with weekly and monthly promotions. The interesting thing about Casino Rewards is that every time you wager at one of the member casinos you’ll earn VIP Points which are accumulated in your VIP account. If you play at more than one member casino the VIP Points will be combined in your single Casino Rewards VIP account and you will then be able to exchange your VIP Points for credit at any casino within the Casino Rewards Network. Casino Kingdom offers over 500 games and boast the latest and most popular releases as well as the quintessential variety of Slots and classic Table Games. No casino would be complete without a large selection of Progressive Slots and Casino Kingdom offer up to 16 titles that are sure to get players rushing to spin for a big win. The Table Games selection consists of Blackjack, Baccarat, Roulette and Video Poker. Each game has its own dedicated page where the basics of the game are described alongside the general rules and a number of useful hints for beginners. At the time of writing, there is no Mobile Casino available for play. The casino’s gaming software of choice is none other than MicrogamingTM and as a result the games and graphics are top-shelf. MicrogamingTM offer a great selection of visually appealing games and the gameplay is always exceptional. Some of the most astounding Slots are powered by the esteemed software developer and as such you’re guaranteed to experience a vast amount of the very best blockbusters. Casino Kingdom also offer an instant play option in addition to their downloadable software platform that runs from your computer promising to be uncomplicated yet of high quality which is suitable for both beginners and advanced players. Security is always an important issue for players and for that very reason Casino Kingdom utilises bank grade 128-Bit encryption to safeguard your transaction and personal details. Transaction can be conducted with British pounds, Canadian dollars, Euros or US dollars (even though they can’t accept players from the US) and a number of banking methods including debit card, credit card, direct bank transfer services for Real Money Payments, pre-paid vouchers and a host of e-Wallets such as Neteller, Skrill and Ukash. The casino offers an extensive Q&A section where most queries can be resolved without the need to contact support. However when that doesn’t suffice, all your queries and issues can be directed to the 24 hour Support Centre via email, toll free numbers (including Britain) as well as Live Chat. We were impressed to find that the casino supports 15 languages and we consider this to be a great boon. Casino Kingdom scores four out of five spades. It would have scored more were it not for the lacking visual aesthetic, but then again it’s not looks that count but what the casino offers you as the player. On that front they’ve got you covered with a large selection of games, a fair amount of continually updated Bonuses and a solid Support Centre that aim to assist with any foreseeable situation.